The Wheel of Life. Another gift from my life-coaching friend. Such a neat tool. The image here is pretty standard, covering the main areas of most people's lives. 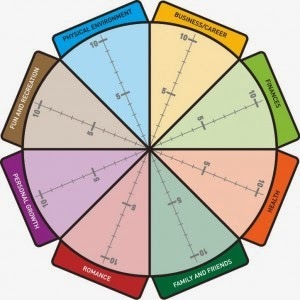 What you do is rate how happy you are with each area of your life, from 0 in the centre, to 10 if that area is perfection. There are at least a few different ways to do this first step. I do it asking myself, "How well am I performing in this particular area?" Others might think more about the external factors in each category, and how happy they are with them, regardless of their own input. For instance, when I rate finance, I think about how happy I am with how I'm managing our finances, and not the absolute value per se. Step two is to join up all the crosses so that you get a visual representation of your bumps (good parts) and troughs (less good). The next steps are the real clinchers. Step 3 is to look at all 8 of the categories, and think about what a "10" would look like. Step 4 is to circle the 3 areas that if they were a 10, would make the biggest difference to your overall happiness. The funny thing about this step is that these 3 are often not the areas scored lowest. The final step is to list three things that you can do in each of those area to improve the score. Nice action plan, no? I'm quite sure I could spend the rest of my life rating my life rather than actually living it. The possibilities are endless.